Hi there! On the moons of Saturn today. Of course, you have heard of the Cassini mission, which toured around Saturn during 12 years. Its journey ended one year ago, after the Grand Finale, during which it was destroyed in the atmosphere of Saturn. It provided us during these 12 years a colossal amount of data, which is a chance for science. It is a chance, since it improves our knowledge of the system. But this also gives birth to new challenges. Indeed, all of these new observations are constraints, with which the models must comply. They must explain why the satellites are where they are, AND why they present the surface features they present, AND why they have their measured gravity field, AND why they have their current shape, AND why the rings are like this, AND why Saturn is like that… You see the challenge. This is why it sparks so many studies. Today we discuss about Orbital evolution of Saturn’s mid-sized moons and the tidal heating of Enceladus, by Ayano Nakajima, Shigeru Ida, Jun Kimura, and Ramon Brasser. This Japanese team performed numerical simulations to try to understand how the orbits of Enceladus, Tethys and Dione, evolved, with being consistent with their possible heating. The evolution is driven by the dissipation in Saturn, in the satellites, and the pull of the rings. This study has recently been accepted for publication in Icarus. 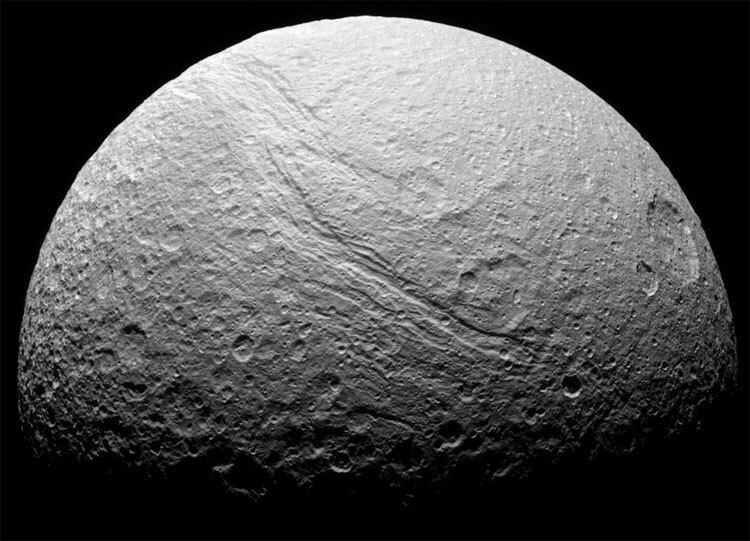 When we speak about the mid-sized satellites of Saturn, usually we mean Mimas, Enceladus, Tethys, Dione, and sometimes Rhea. The inner moons orbit inner to the orbit of Mimas, and are embedded into the rings. However, Titan, Hyperion, Iapetus and Phoebe are just too far. Besides these, there are small moons which are embedded into the mid-sized system of Saturn. Let us go back to the mid-sized. You can find below some of their characteristics. The unit “R” in the semimajor axis column is Saturn’s radius, i.e. 58,232 km. You can see that the size of the satellites increases with the distance. This has motivated the elaboration of a scenario of formation of the satellites from the rings, by Sébastien Charnoz et al. In this scenario, the rings would be initially much more massive than they are now, and the satellites would have emerged from them as droplets, removing their mass from the rings. Then they would have migrated outward. In such a scenario, the further satellites would be the older ones, and the massive ones as well. Regarding the mass, this is just true. 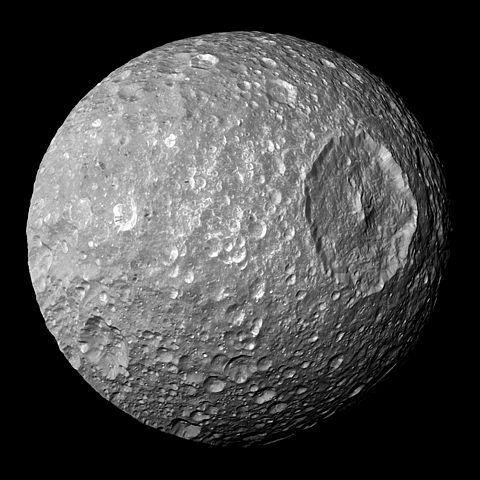 Mimas is known for its large crater Herschel, which diameter (139 km) is almost one-third the diameter of Mimas. It makes it look alike Star Wars’ Death Star. Its widely craterized surface suggests an inactive body. However, measurements of its east-west librations are almost inconsistent with a rigid body. It would contain an internal ocean, but explaining why this ocean is not frozen is a challenge. 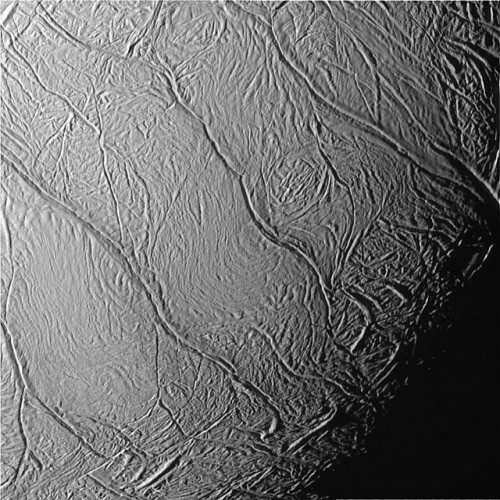 Enceladus may be the most interesting of these bodies, because its surface presents geysers, and tiger stripes, which are tectonic fractures and ridges. This proves Enceladus to be a differentiated and hot, active body. It dissipates energy, and we need to explain why. Tethys is quieter. It presents many craters, the largest one being Odysseus. Besides, it has a large valley, Ithaca Chasma. It is up to 100 km wide, 3 to 5 km deep and 2,000 km long. Its presence reveals a hot past. Like Tethys, Dione and Rhea present craters and evidences of past activity. Enceladus, Tethys, Dione and Rhea present evidences of activity. Enceladus and Dione have global, internal oceans, while the other two may have one. Mimas presents a very quiet surface, but may have an ocean as well. All this means that these 5 moons are, or have been excited, i.e. shaken, to partly melt, crack the surface, and dissipate energy. The primordial heat source is the decay of radiogenic elements, but this works only during the early ages of the body. After that, the dissipation is dominated by the tides raised by Saturn. Because of the variations of the distance between Saturn and the satellite, the gravitational torque changes. Its variations generate stress and strain, which are likely to dramatically affect the internal structure of the satellite. Variations of distance are due to orbital eccentricity. As you can see, some of the satellites have a significant one, with the exception of Tethys. And the eccentricity may be excited by mean-motion resonances. Let us go back to the orbital properties of the satellites. You can see that the orbital period of Tethys is twice the one of Mimas. Same for Enceladus and Dione. This did not happen by chance. These are mean-motion resonances. The 2:1 Enceladus-Dione one excites the eccentricity of Enceladus, and so is responsible for its currently observed activity. However, the Mimas-Tethys resonance, which is a 4:2 one (the reason why it is 4:2 and not 2:1 is pretty technical, see here), excites the inclination of Mimas, and slightly the one of Tethys as well. As I said, this configuration did not happen by chance. The satellites have migrated since their formation, and once they encountered a resonant configuration, they actually encountered a stable location. And sometimes stable enough to stay there. Two processes have been identified for being responsible of the long-term migration: the tides and the pull of the rings. The tides are the result of the interaction with Saturn, the satellites being finite-size bodies. As a consequence of their size, the different parts of the satellite undergo a different torque from Saturn, and this generates stress and strain, i.e. dissipation of energy. But the satellite exerts a torque on Saturn as well. The consequence is a competition between the two processes, resulting in a variation of the orbital energy of the satellite. If the satellite gains energy, then it moves outward. However, if it dissipates energy, it moves inward. The tides also tend to circularize the orbits, i.e. damp the eccentricities. Beside this, the rings exert a pull on the satellites. The main effect is on Mimas, because of its distance to the rings, its limited size, and the fact that it has a resonance with the rings. It has a 2:1 mean-motion resonance with the inner edge of the well-known Cassini Division, i.e. a 4,500-km wide depletion of material in the rings. At the inner edge of the Division, which is actually the outer edge of the B ring, you have an accumulation of material. This accumulation tends to push Mimas outward. we know the main geological features, in particular the impacts and the ridges, to estimate the energies which has created them. If you want to explain something, you should better try to not violate any of these observations. A very tough task. SET 1a: Enceladus older than Tethys. This is suggested by the backward extrapolation of the orbits of Enceladus and Tethys, without mutual interaction, but migrating because of a highly dissipative Saturn… which can be allowed by the data. The consequence of such a scenario is that Tethys is originally closer to Saturn than Enceladus, and must cross its orbit to be further. SET 1b: Enceladus and Tethys starting with the same semimajor axis. Actually an end-member of the previous case. SET 2a: Tethys is older than Enceladus, and the rings affect only the semimajor axes. SET 2b: Almost the same as SET 2a, with the exception that the rings also affect the eccentricities of the satellites. The hypothesis that Enceladus is older than Tethys should probably be discarded. Indeed, the simulations end up in collisions between the two bodies, which is inconsistent with the fact that we can actually see them. So, this means that Tethys is older than Enceladus. However, the simulations of the sets 2a/b are not entirely satisfying, since the satellites end up in resonances, in which they are not now, which constitutes a violation of the observational data. This is particularly true if you include Dione in the simulations. These resonances should have been encountered before the current ones. In other words, either the satellites were not trapped, but the simulations show they were, or they escaped these resonances after trapping. Some studies suggest that a catastrophic event could do that. A catastrophic event is an impact, and the surfaces of these bodies show that they underwent intense bombardments. Why not? The webpage of Shigeru Ida. and the one of Ramon Brasser.